Citroen driver Sebastien Loeb became the new world rally champion on Sunday after finishing second behind Markko Martin in the Rally of Corsica. The Frenchman just needed to finish fourth or better to claim the title, and did so comfortably. Ford's Markko Martin won the rally after Francois Duval's retirement with mechanical problems eliminated his only serious challenger. Citroen clinched the constructors crown for the second season in succession. Carlos Sainz finished third in Corsica behind team-mate Loeb, with former champion Marcus Gronholm in a Peugeot taking fourth spot and outgoing world champion Petter Solberg, in a Subaru, in fifth. 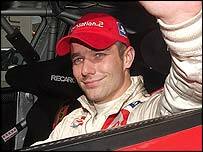 Solberg had made a late bid to retain his crown, winning the previous three rallies, but Loeb's five victories - in Monte Carlo, Sweden, Cyprus, Turkey and Germany - helped him claim his first world title. Loeb took the final day cautiously in Corsica and he was helped when Belgium's Duval, who was second overnight in a Ford Focus, pulled out after five miles with engine failure.